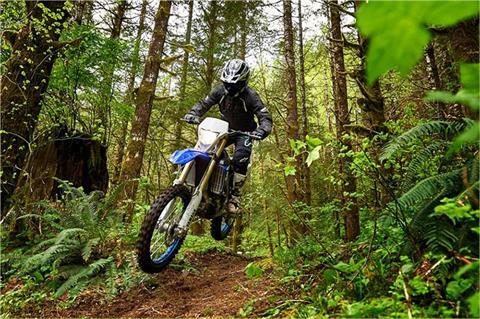 Packed with "out-of-the-box" off-road features -- perfect for enduros and off-road thrill seekers. 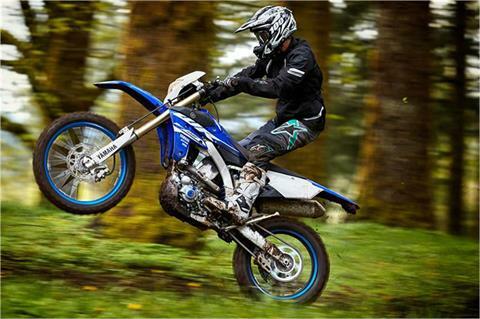 BILATERAL BEAM ALUMINUM FRAME: YZ450F-based frame offers a compact size while optimizing mass centralization. 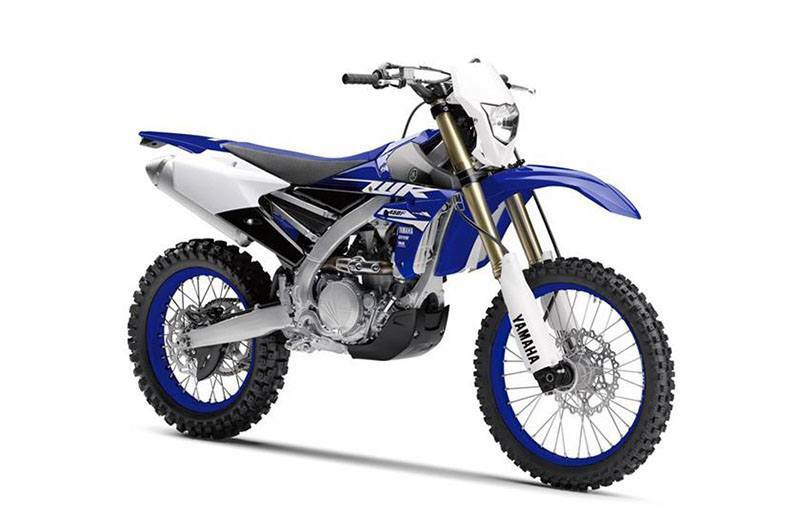 With its extensively tested assembly of aluminum forgings and extrusions complete with model-specific engine mounts, the WR450F frame retains legendary Yamaha handling and response. COMPACT AND LIGHTWEIGHT CHASSIS: Compact YZ450F-based chassis provides a lightweight feeling with advanced suspension systems for plush and responsive performance for the most demanding rider. LEGENDARY KYB® YZ450F FORK: Industry leading, fully adjustable YZ450F-based KYB® spring-type fork with speed-sensitive damping and Kashima Coat™ has been specifically tested and tuned for enduro racing and delivers precise, fade-free handling. 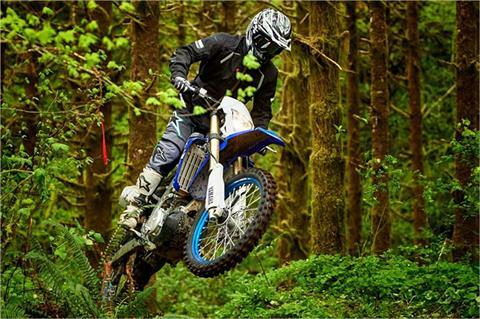 Fork protectors provide excellent tube protection. 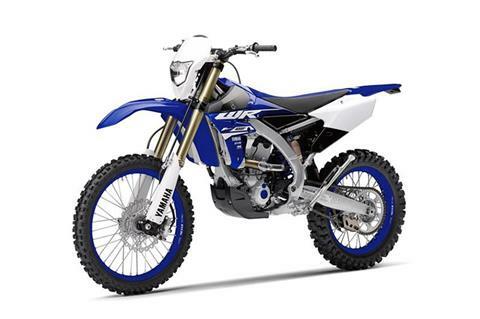 WR450F SHOCK TUNING: The KYB® shock provides 12.5 inches of wheel travel with adjusters for high- and low-speed compression damping, rebound and spring preload—and features a large piggyback reservoir for excellent damping and fade resistance—all tuned especially for the WR450F. LARGE 270MM FRONT BRAKE: Large diameter 270 mm front brake system is the same disc fitted to the YZ450F, for exceptional stopping power and braking control. 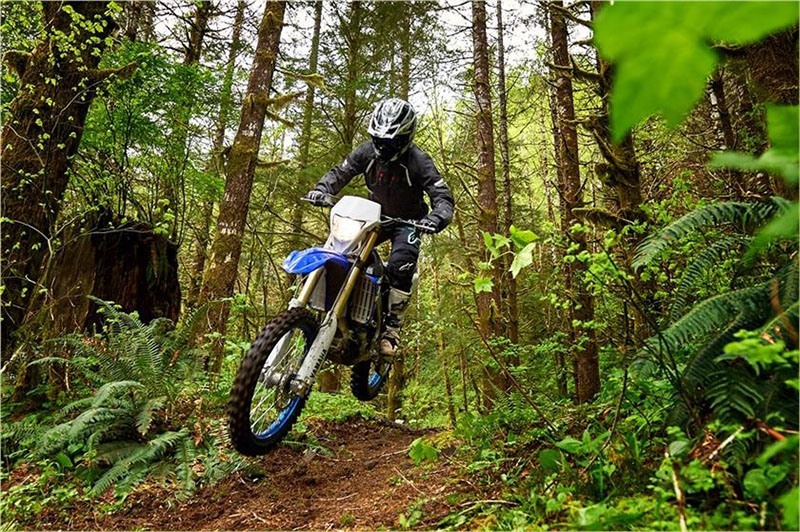 ENDURO-SPECIFIC TIRES AND WHEELS: 18-inch enduro-specific rear wheel and tire provides added comfort on rough trails as well as reducing the possibility of pinch flats. 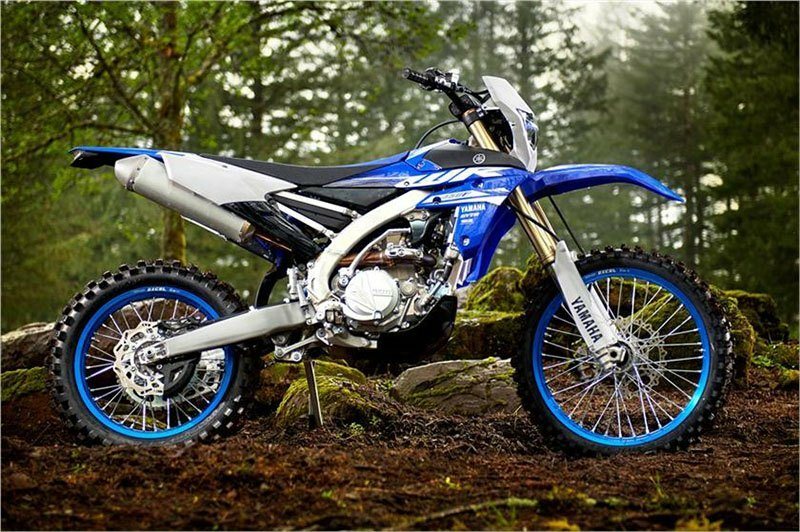 ENDURO-TUNED YZ450F POWER: YZ450F-style 449 cc liquid-cooled DOHC four-stroke with four titanium valves and forward intake and rearward exhaust shares the YZ450F’s piston and cam profiles, with WR450F-specific silencer and ECU tuning built for enduro racing. ADVANCED FUEL INJECTION: Fuel injection system delivers precise throttle response and smooth power delivery at all altitudes and temperatures, featuring a high- performance 44mm throttle body. The air filter is easily accessed without tools and is positioned high in front of the bike, away from dirt roost from the rear tire and further away from water and mud. COMPACT ENGINE LAYOUT: Dry-sump lubrication system carries the oil reservoir inside the engine cases, for excellent mass centralization and no exposed oil lines that can be damaged. 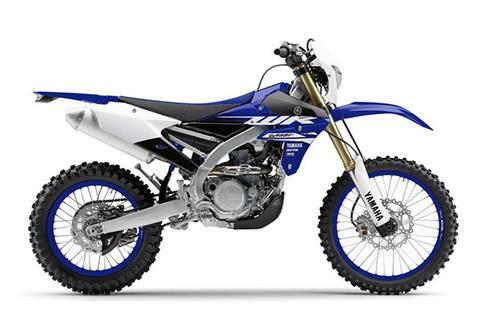 YZ-F-DERIVED COOLING SYSTEM: Large-capacity YZ450F radiators provide maximum cooling efficiency with great strength, and come standard with a cooling fan for additional airflow under demanding race conditions. 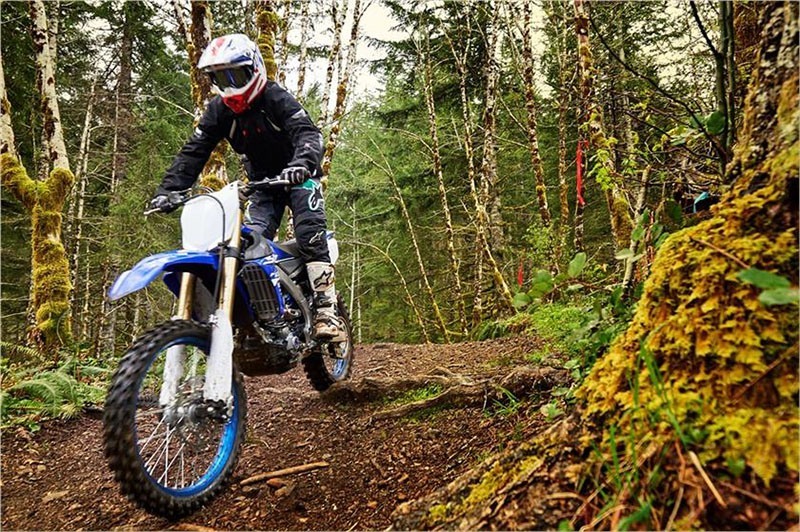 ENDURO-READY WIDE RATIO GEARING: Wide-ratio five-speed transmission and enduro-spec multiplate clutch—ideal for the rigors of tight woods racing. REAR POSITIONED EXHAUST LAYOUT: Lightweight exhaust system maximizes engine power while centralizing the mass of the exhaust system, thanks to the innovative wrap-around design. 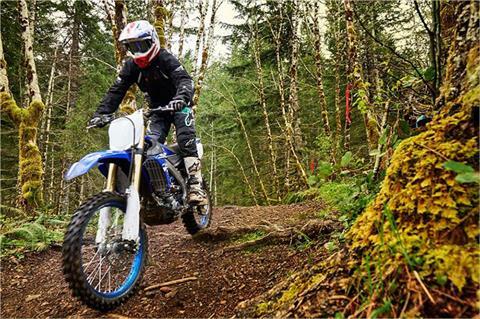 ELECTRIC STARTER SYSTEM: Electric starter provides effortless, convenient restarts, while a main switch-free electrical system makes starting and riding away even easier than before. DISTANCE-READY WR ERGONOMICS: YZ-family derived bodywork and seat look and feel excellent on long rides, with ultra-wide footpegs, four-position, rubber-mounted adjustable bar clamps and a tapered aluminum handlebar for great on- the-trail comfort. REAL WORLD TOUGH FEATURES: All this, including: tool-less access air box, 18-inch rear wheel, plastic skid plate, tapered aluminum handlebars, wave-type brake rotors, electric start, on-the-fly clutch adjuster, O-ring chain and aluminum side stand. 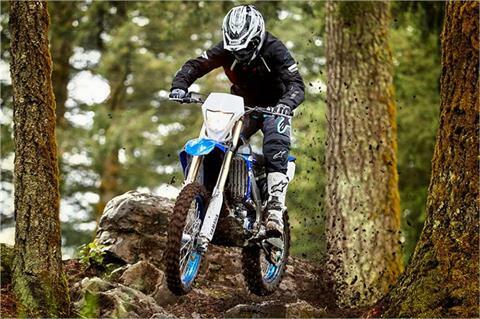 This machine is ready for tight trails, woods, or desert fun. 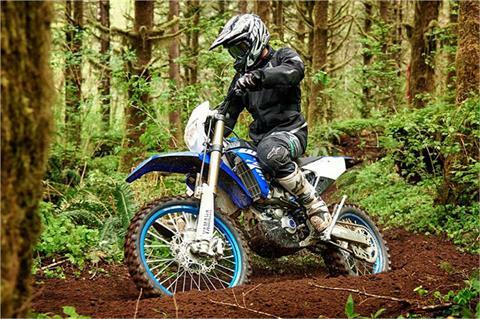 ENDURO COMPUTER: Multi-mode enduro meter includes engine warning and fuel level warning lights. Standard mode displays speed, two trip meters and clock functions, while race mode features average speed, race time and trip functionality. INNOVATIVE YZ450F-BASED ENGINE DESIGN: With a revolutionary rearward slanted, liquid- cooled, DOHC 4-stroke powerplant with four titanium valves based on the YZ450F™, a wide ratio five-speed transmission and WR- specific modifications—the WR450F™ is an “out-of-the-box” enduro machine. ELECTRIC STARTER SYSTEM: Main switch-free electrical system provides push-button electric starting convenience. Just push the starter button and go—no need to power on a main switch or insert a key. BILATERAL BEAM ALUMINUM FRAME: The WR450F features a YZ-bred aluminum bilateral beam frame—engineered from castings, forgings and extrusions—with engine mounts optimized for chassis rigidity characteristics needed in enduro riding conditions. INDUSTRY LEADING KYB® SUSPENSION: Industry leading, fully adjustable YZ450F-based KYB® spring-type forks with speed-sensitive damping and KYB® shock delivers precise, best-in-class, fade-free handling. 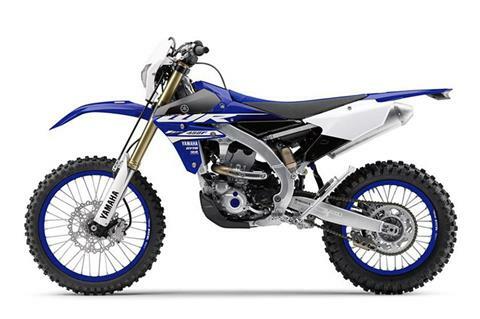 ENDURO-READY WR450F FEATURES: WR450F-specific details include a new wide-ratio five-speed transmission, temperature regulating radiator fan, an optimized clutch, sealed O-ring chain, enduro-specific tires with an 18-inch rear wheel, skid plate, kick start, and a standard side-stand. 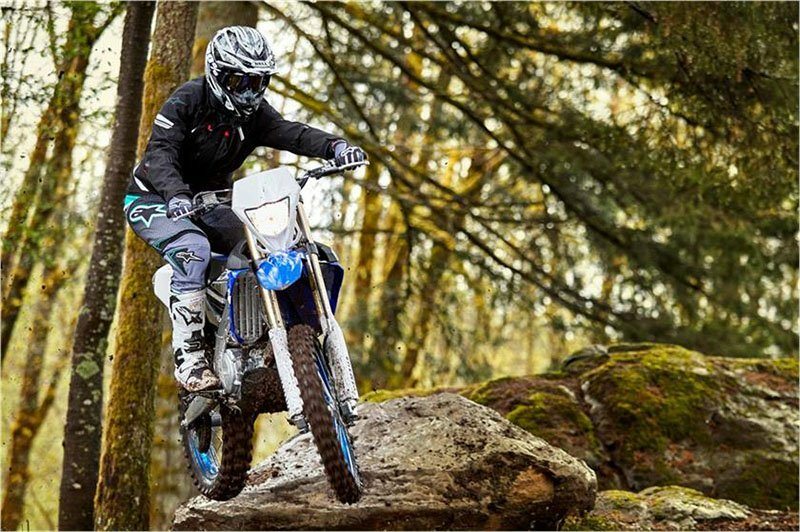 A bright headlight, LED taillight and a complete LCD enduro race computer are ready for long race days. 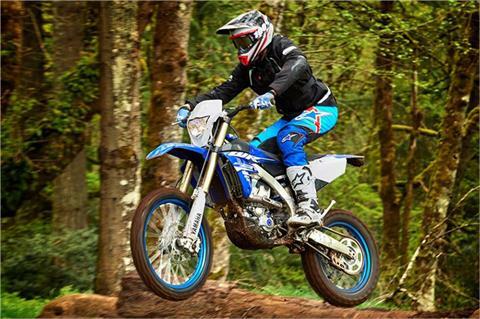 270MM FRONT BRAKE: 270mm front disc brake offers outstanding machine control and performance, with exceptional stopping power and controllability.